Today is the Feast of Corpus Christi, a Western Catholic tradition. Catholics (and a few other religions) celebrate this day with processions through the streets of towns and cities around the world. But something that seems to be unique to Barcelona (or certainly Catalonia) is the tradition of L’Ou com Balla (the Dancing Egg). There are many stories as to its origins. Some say it’s a metaphor for the cycle of life or simply that it was an amusement for the nobles as the processions went by (which I much prefer). But it does seem to have been going on for a rather long time. Since the sixteenth century! That’s quite a few eggs! So what is L’Ou com Balla? Well, L’Ou com Balla is simply an empty, hollowed out egg that is placed on the jet of a fountain where it appears to dance about in the spray. If it stays there all day it is supposed to be a good sign. For what exactly I’m not quite sure. It seems a strange thing to place your faith in but there you go. But it is quite mesmerising. And the decorations around the small fountains are pretty spectacular too. 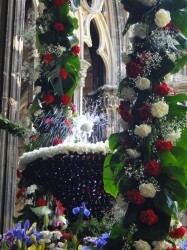 Flowers, fruits and other plants adorn the fountains. Where can I see the Dancing Egg? Although supposedly started in the Cathedral cloisters (and where I saw it today) you can also see it at Ateneu Barcelonès, Casa de l’Ardiaca, the Santa Anna Church, the Frederic Marès Museum, Real Academia de Bones Lletres and Palau del Lloctinent and a few other places besides I’m sure. Go and see it. It’s one of those endearing traditions that I so love about Barcelona. Or, as I think it only happens today, you can watch my Hollywood production instead. I have been here for 5 years and never heard of this. And I missed it this time! Next year. Thanks for the video.